Very unlike the “traits that define” Asperger’s Syndrome – or more recently – as it is lumped in now in the DSM 5 with Autistic Spectrum Disorder – a lack of empathy is just not an accurate trait to list in consideration of diagnosis. The first issue is the scales and tests to diagnosis Asperger’s in the first place, especially since what is currently available has lacking measuring ability of attributes (feelings) like empathy. Secondly, there are no diagnostic scales or tools to recognize Asperger’s in its many expressions in females. It’s still thought of being mostly a “male” thing. As an adult with Asperger’s who was diagnosed at the age of 40, but really, coming to that awareness explained so very much of my childhood and life experience that I had never had a way to truly understand before being diagnosed. I know that I do not lack empathy. In fact, I’ve known for longer than I have known I’ve had Asperger’s Syndrome all my life, that I have too much empathy. Each person with Asperger’s (AS) is an individual. There are differences in how empathy is felt in those with AS compared to Neurotypicals (NT’s). My sense is that NT’s feel it and fairly spontaneously express it. They express it to each other, relatively speaking, in ways that are easily identifiable and expected and therefore they have a common language of empathy. That’s what I’ve always believed the biggest difference when it comes to this question of empathy and AS vs Neurotypicals and their empathy lies. It doesn’t have anything to do with people with AS not feeling empathy. It has all to do with how or when or to whom that empathy will be expressed, how and when. People with AS, and I know this from my own experience, process all feelings and information differently than NT’s. That’s not to say all with AS are the same. Just as all who are NT are not the same. However, people with AS do process information and feelings differently from those who are NT. This means that there may be a delay in expressing what is felt or a difficulty in expressing it coupled with an NT expecting to have it expressed to them the same way as other NT’s would express it. As an adult with Asperger’s I know that it takes time for me to process information. I do that rather rapidly but I still have to run it all inside first before I start to share it. The same is true of emotions. I will run them inside, feel them, and then express them. I can relate to feeling, as others have described (online youtube videos and blogs) too much empathy interpersonally and an even deeper over-whelming empathy in the context of empathy for things that happen to people or in humanity – feeling as equally deeply empathic about the later as the former. Something that many NT’s don’t seem to feel as much. For example, on 9/11, when we first heard of the attack on the U.S. others I was with reacted, of course, but were pretty focused on phoning their loved ones. Even though we were in Ontario, Canada, we aren’t really that terribly far away from New York, New York. Nobody knew what was going on as that began to unfold. Unlike everyone else I was with who started running to phones to call loved ones with the sense that they needed to get home, pick up kids from school, get together and do what? Be safe? Be safer? I don’t know to this day. Why not? Because my reaction was one of experiencing a panic attack because I was overwhelmed with the feelings of humanity that day. All humanity, generally, and specifically those suffering directly, even though at this point, I’d still only been told what was going on and had not yet seen anything on television at that point. It was a deep extreme empathy that was for all of humanity as all of humanity (and the years have born this out) was attacked that day and that day is a day that has changed our world in ways that are not for the better. I felt so much that I didn’t think about myself at all. I was not at all thinking or feeling the same things or in the same ways with the same focus as those around me who were all NT’s. I wasn’t thinking I needed to call someone and be with them or run somewhere. I felt the agony of humanity and I felt so palpably the agony of that day and all that it meant in human suffering. 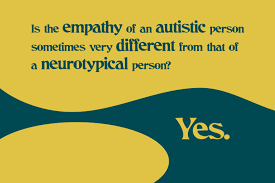 Yes, this is just one example, but likely way more individuals with Asperger’s, feel too much, it’s not that we don’t have empathy or that we have not enough empathy. I have learned how to grow and change and push boundaries in terms of how Asperger’s is traditionally thought to be. I know others have done this in their own ways too. We don’t get rid of Asperger’s (frankly I wouldn’t want that at all!) but we can continue to grow and to further extend the bridge of communication to and from NT’s and ourselves. I experience being an adult with Asperger’s as having a different ability. Yes, at times, it can be challenging. I have also since 9/11 really learned how to have better emotional boundaries with all I feel for others and that are the feelings of others. I still feel it and it can still overwhelm me but I do have boundaries and ways of dealing with it more effectively. I think what I feel that is too much empathy (though I don’t express it as such) I have learned to sit with, feel, process, and move through much more quickly. I wouldn’t trade that for anything even though at times it is quite painful. To me, it’s me. It is also a profound connection to humanity that I have always known and would not want to change. Feeling for others, even on the other side of the world, that I don’t know or will never meet, as deeply empathic as I can feel for someone close to me (though the feelings aren’t exactly the same) matters greatly to me. I wonder, is part of the problem with empathy in humanity that not enough NT’s empathize enough with humanity beyond their loved ones? Not saying they don’t care but it seems that if we are trying to measure this and compare this that NT’s would lag behind many with AS when it comes to empathy for humanity to such a profound level it hurts in ways that are difficult to describe. We need to give each other room to be who each one of us is. We need to be willing to communicate to understand how each other collectively and individually feel things and express things or feel things and don’t necessarily express them the same way as we continue to honour our differences respectfully. © A.J. Mahari, January 17, 2015 – All rights reserved. Do Aspies Have Empathy For Others? What is the Impact of Jenny McCarthy’s Autism Cure Claims To Those Adults With Asperger’s Syndrome? Asperger’s and Neurotypical People – What do they have in common? Copyright © A.J. Mahari [2000-2013]. All Rights Reserved.